This palette shows all the image layers. This palette allows you to view, organize, edit, and delete image layers. Refer to the 'Layers' menu item for more information. The New Raster Layer command allows you to insert a new Raster Layer above the currently selected layer or group. If no layer or group is selected, Pop Art Studio adds the layer to the top of the layer stack. The New Vector Layer command allows you to insert a new Vector Layer above the currently selected layer or group. If no layer or group is selected, Pop Art Studio adds the layer to the top of the layer stack. The New Group command allows you to insert a new group above the currently selected layer or group and adds the currently selected layer to the new group. If no layer or group is selected, Pop Art Studio adds the group to the top of the layer stack. The Duplicate command allows you to duplicate the currently selected layer or group. The Delete command allows you to remove the currently selected layer or group. Deleting layers you no longer need reduces the size of your image file. The Properties command allows you to show the layer name and the visibility of the layer. Merging down causes all selected vector objects and bitmap objects to be flattened into the bitmap object that lies just beneath the bottommost selected object. The result is a single bitmap object. Vector objects and bitmap objects cannot be edited separately once merged, and editability for vector objects is lost. When you have finalized the content of a group, you can merge the layers to reduce the size of your image files. When you merge layers, the data on the top layers replaces any data it overlaps on the lower layers. The intersection of all transparent areas in the merged layers remains transparent. The Move Up command allows you to move a layer or group up the layer stack. You can move a layer in and out of a layer group. The Move Down command allows you to move a layer or group down the layer stack. 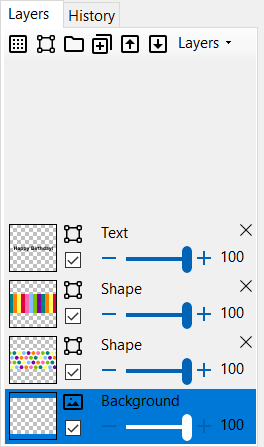 You can move a layer in and out of a layer group.